Discover in our restaurant the Arabic cuisine cooked by our chefs using the best recipes. Authentic and unique Taamiya Falafel. Falafel is one of the most popular dishes of the Middle East and North Africa, it is served as a starter and is very tasty and nutritious. The Falafel is given the form of a croquette fried with olive oil and is made with ground chickpeas; other recipes can use beans, red beans or red lentils. It is mixed with chopped onion, fresh parsley, coriander, garlic and a pinch of black pepper. 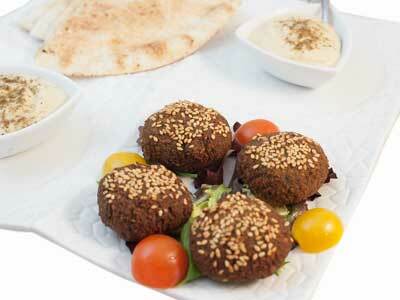 Falafel can be served as an appetizer with Hummus, Tahini, or as the main dish. Shawarma is a delicious Arabic dish and can be made both with spicy chicken or lamb; it consists of thin slices of roasted meat, rolled up with pita bread with onion, parsley and tomato, accompanied by vegetables and seasoned with different sauces. The dressings include Tahini, Hummus and turnips in vinegar. Hummus is a dish from the Arabic cuisine. Light and nutritious, it is very beneficial to the body because of its high protein content. It consists in a cream of mashed chickpeas which includes sesame cream and olive oil. We also offer our Hummus The Alhambra, our variety with beetroot. The Sambusa dish is a nutritional intake composed of tasty rolls which can be stuffed with feta cheese, a cheese with fewer calories than others that is also excellent for any diet. These rolls can also be stuffed with meat or vegetables. 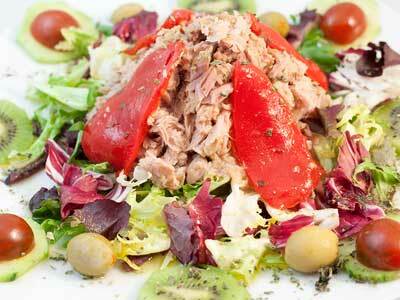 A delicious salad with lettuce, tomato, tuna-fish, aromatic herbs and olive oil that provides a rich flavour with a mixture between sweet and savoury. We also offer the Nile Salad, which includes feta cheese; the Tabbula with onion, parsley, mint and olive oil, and the Fattuch salad, with tomato, cucumber, carrot, radish and Arabic bread. All of them are fresh salads, juicy and very healthy. 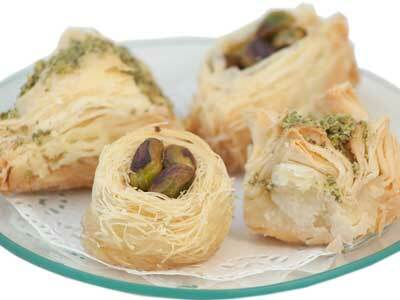 We produce some of the Arabic pastry which has served as an inspiration to other pastry chefs. Pastry occupies an important place in our gastronomy. In our restaurant, you can taste desserts such as the Um Ali, a tasty dessert that is served hot, made with wheat flour, milk, nuts, raisins and grated coconut with a delicious aroma; the Halkum, the Baklawa, the mango Kunafa with honey, or the Kunafa Almanzor with honey, cream and dates ice cream. Our dishes are a gastronomic reference of the Arabic cuisine in Cordoba; our restaurant is a compendium of comfort, tradition, gastronomy and good work. 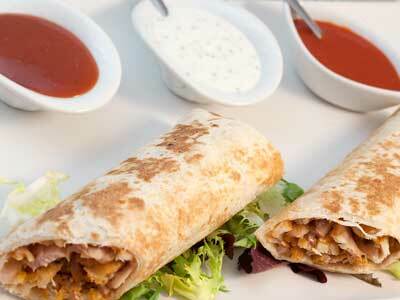 Our Arabic cuisine is exquisite, spiced with moderation, a cuisine of contrasts with a great richness and tradition. 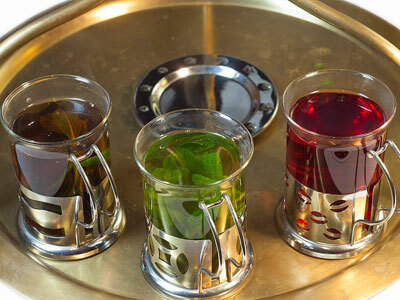 We have an extensive and varied offer of types of teas. Tea is a drink with multiple benefits for our body because it contains antioxidants, it reduces stress, it is a digestive support and lowers the level of hypertension. Its fragrance and taste are the aspects of tea that can be felt in the mouth and throat, with a bitter sensation that is followed by a wonderful sweetness. The Arabic coffee we serve is unique; it is served without sugar and accompanied by high-quality dates. Food and beverages are Halal. Both food and beverages respect the Muslim dietary patterns, both in production and in transport and storage. There is no food served that does not meet these criteria. Our restaurant menu also has a considerable number of vegetarian and vegan dishes. 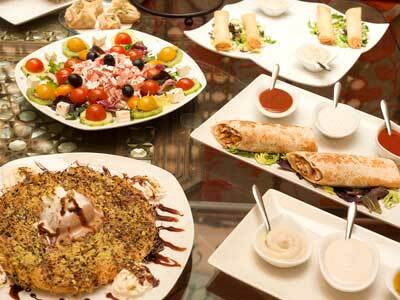 The dishes are prepared with carefully selected fresh ingredients.